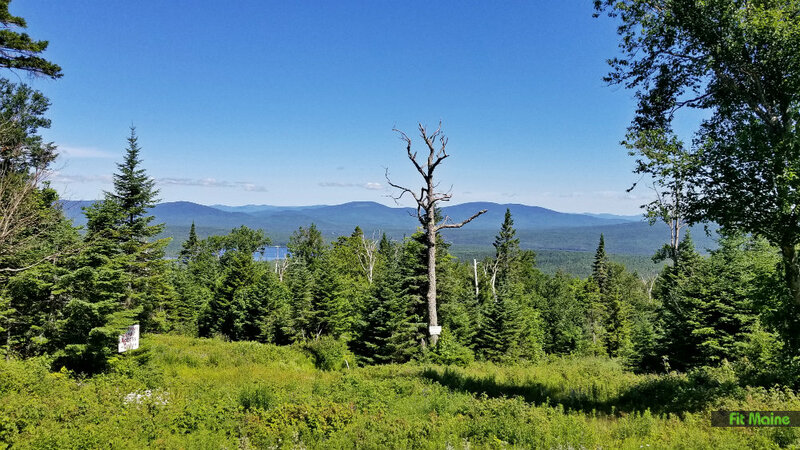 The wonders of Rangeley. 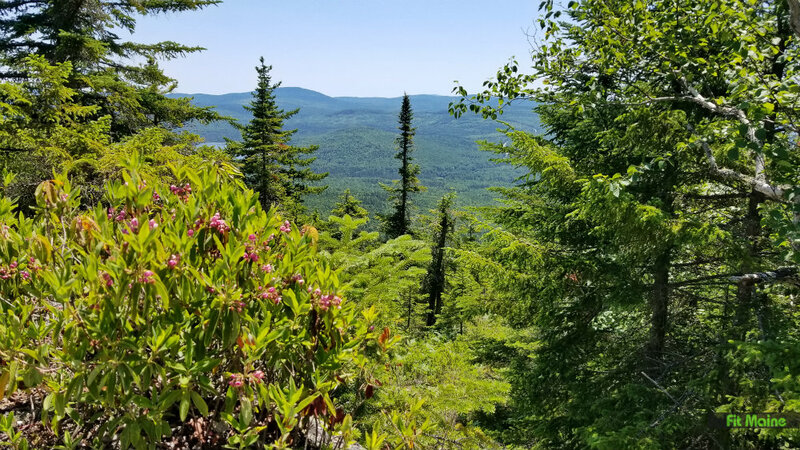 There are way too many to count – and certainly too many to experience in a five-day camping trip – but I did my best last month to cram in as much hiking, paddling, and waterfall-hunting as I could. 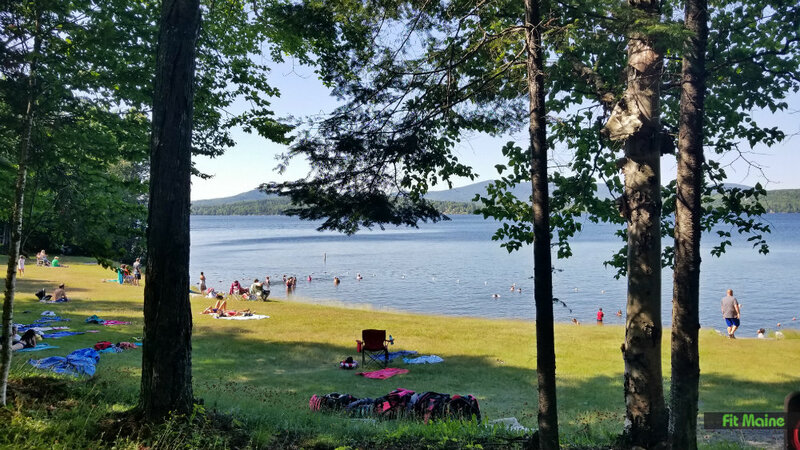 My base camp: Rangeley Lake State Park. 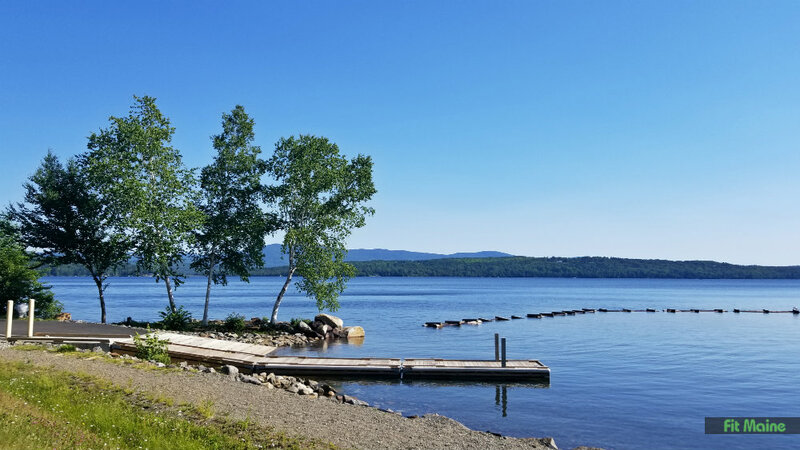 Situated off S. Shore Road on the southern side of Rangeley Lake, the park has a public boat launch, swimming area, and free hot showers. 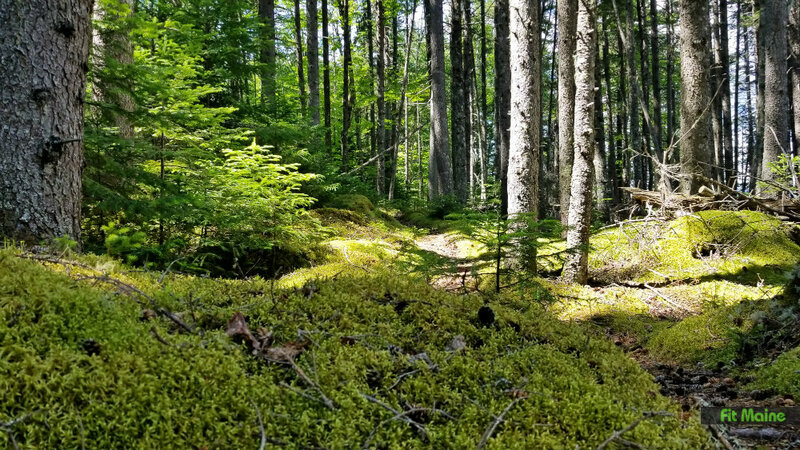 The campsites are semi-private (enough trees between each site so you’re not staring at your neighbors all day, but not exactly tucked away, either). 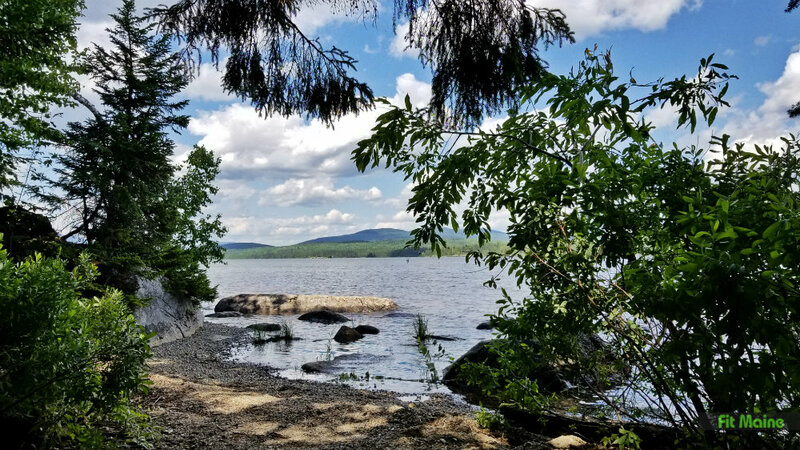 The campground was super quiet while I was there, and I really loved getting to chat with some of the camp hosts who gave me a tip on paddling from the campground to South Bog Stream, which you can access from Rangeley Lake. 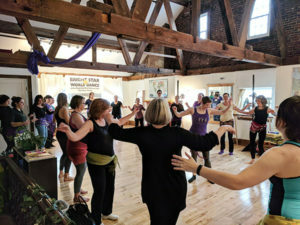 More on that below. 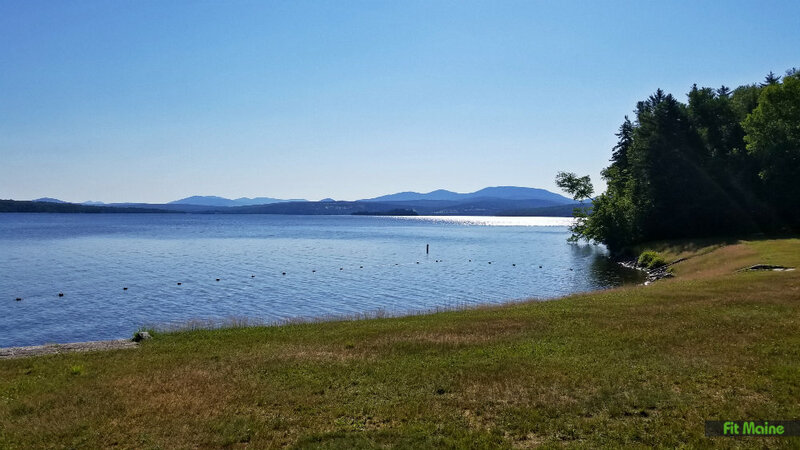 Since I was staying at Rangeley Lake State Park, it was a given that I’d spend a lot of time on Rangeley Lake. 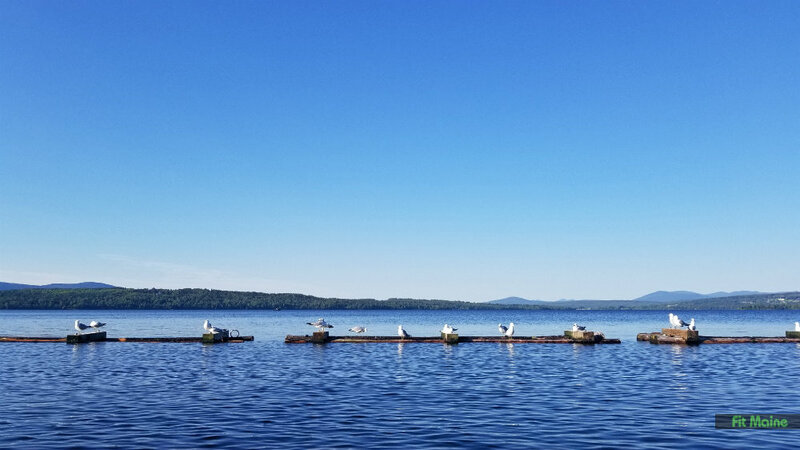 There’s a public boat launch in the park (there’s also a public launch at the park in downtown Rangeley) with loads of parking. 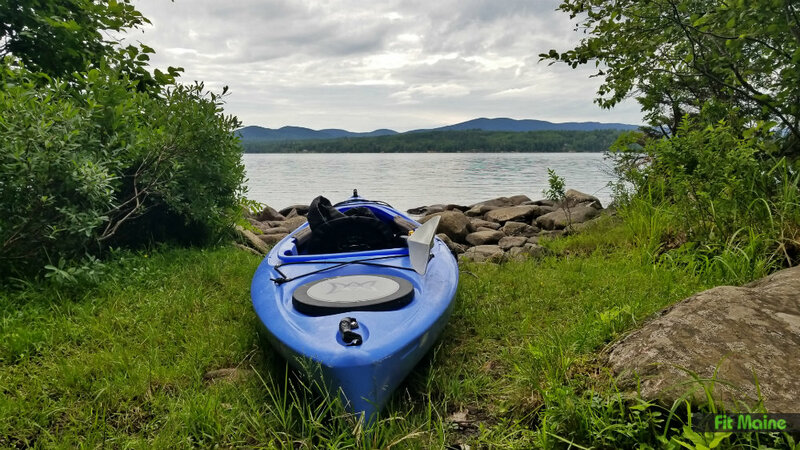 There’s also a neat hand-carry put-in that was super close to my campsite (site 30) – so close that I could carry my kayak from the campsite. 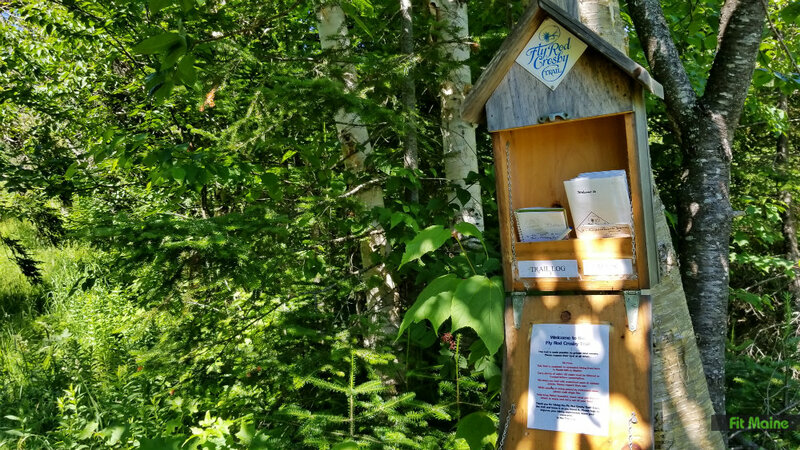 This little put-in also happens to be super close to where South Bog Stream meets Rangeley Lake, so it’s handy on a number of accounts, if you happen to be camping in the park and you happen to have a campsite near #30. 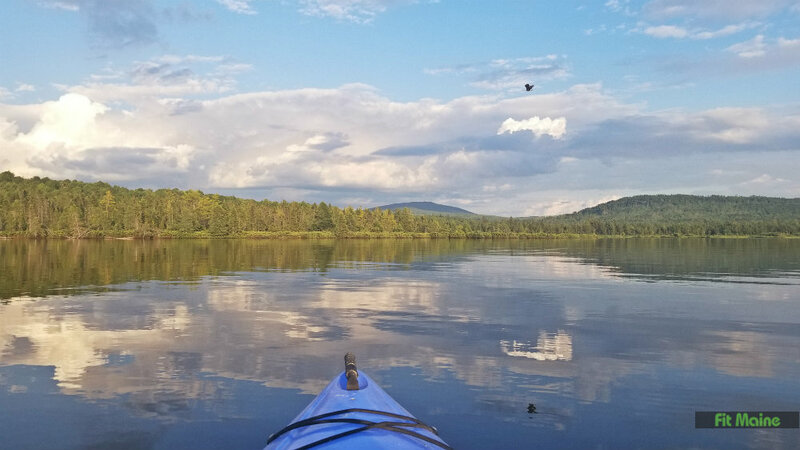 However you get onto it, Rangeley Lake is a big’un – there’s plenty of space to explore, whether you’re in a motor boat or a kayak. 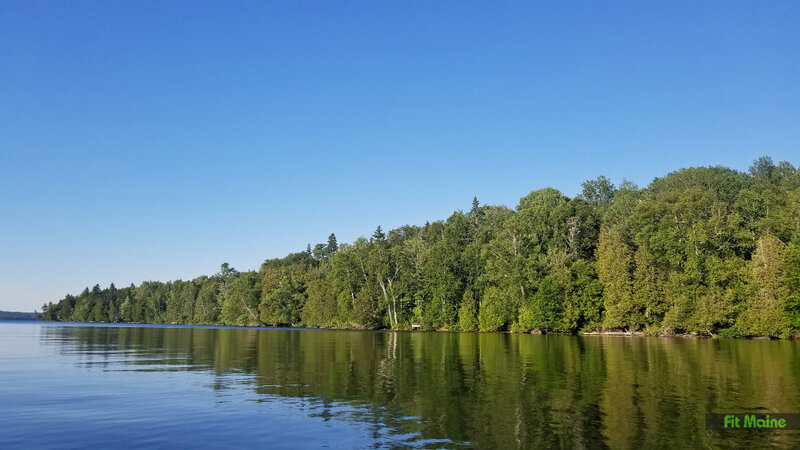 It can get windy on the lake during the day, but I found the mornings and evenings were supremely calm and quiet – low winds and surprisingly few people on the water. 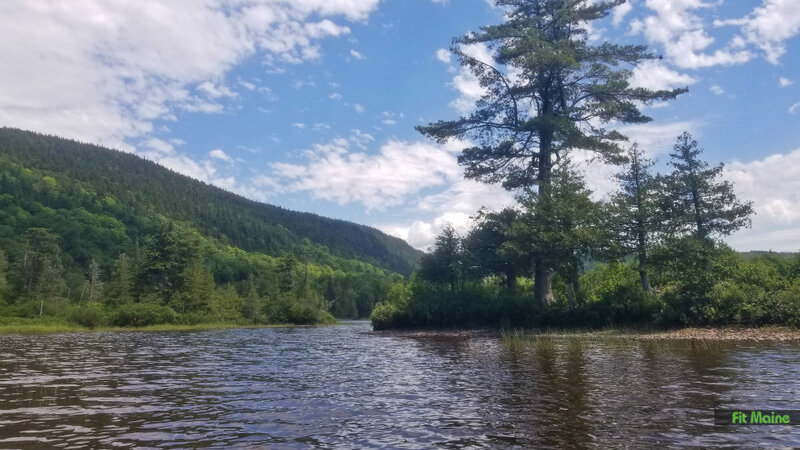 South Bog Stream is a small stream that winds through the South Bog Conservation Lands, a conservation area adjacent to Rangeley Lake State Park. 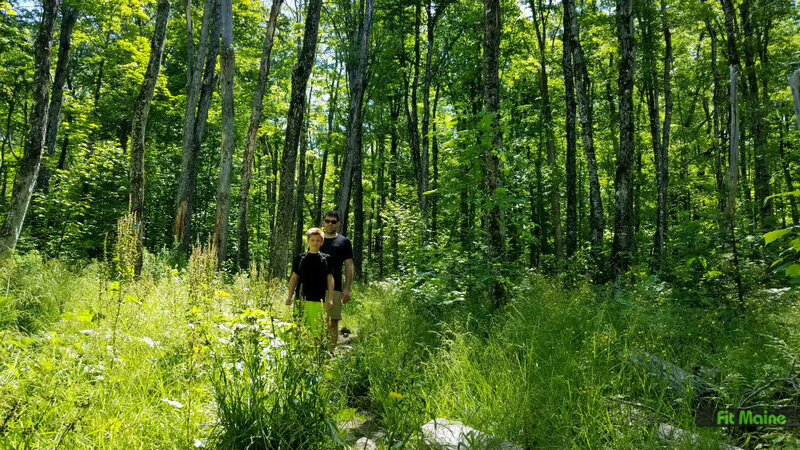 You can hike the trails here (about three miles of network trails that go through open fields and wetlands and over a stream. 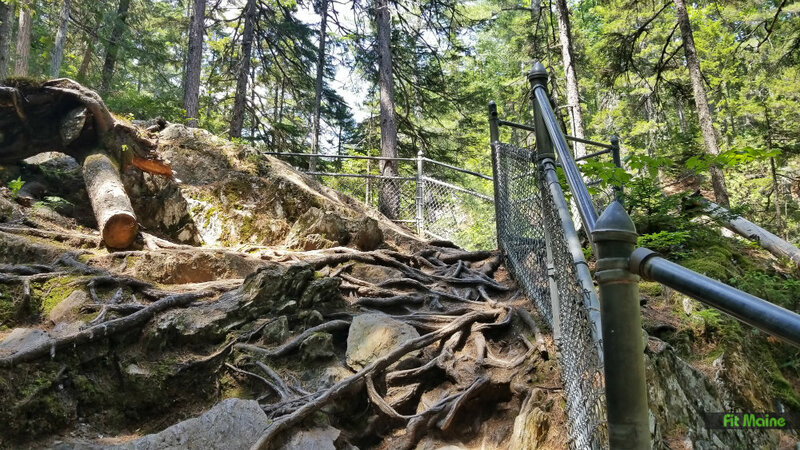 The trailhead is accessible from S. Shore Road. 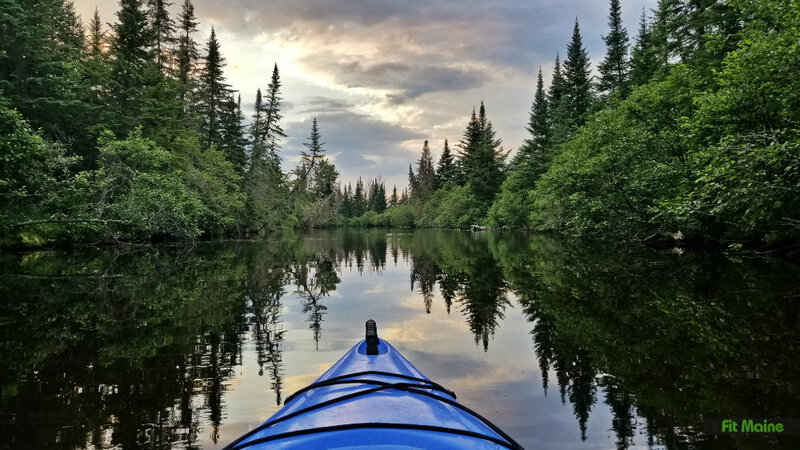 But exploring this stream via kayak is really lovely – with its easy-going waters and curves covered in shrubs. 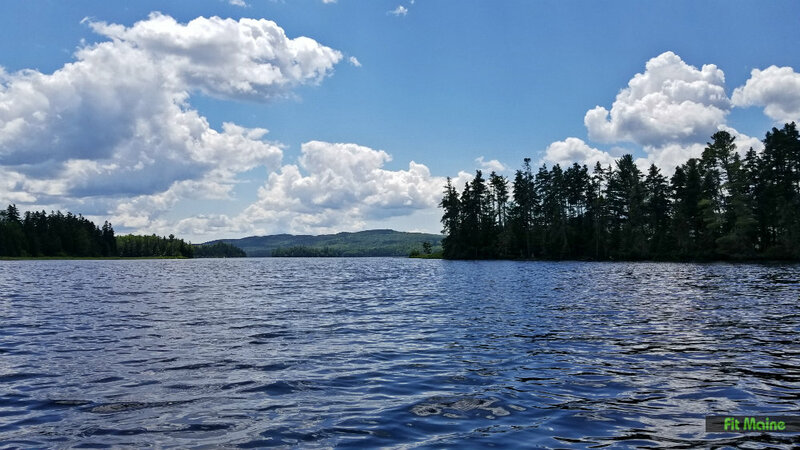 To paddle here, you’ll need to enter the stream from Rangeley Lake (I’ve read a reference online about there being a hand-carry boat launch on the property, but the Rangeley Lakes Heritage Trust makes no reference of it, so I’m uncertain if it actually exists). 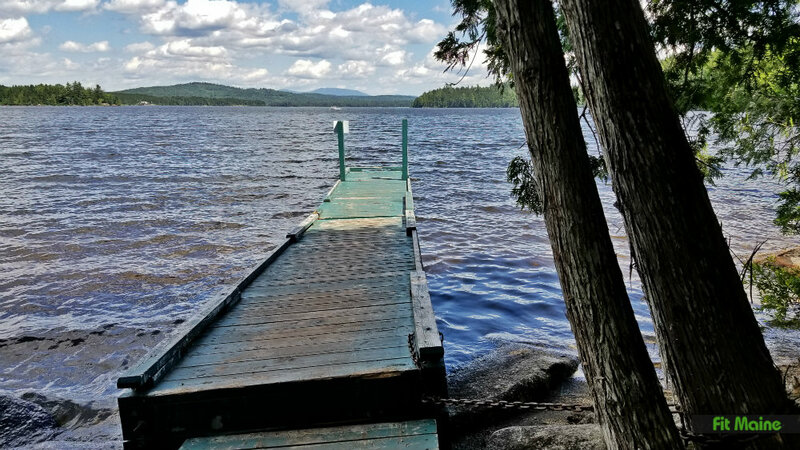 Instead, you’ll need to enter the stream from Rangeley Lake using one of the public boat launches (the Oquossoc public boat launch on the western side of Rangeley Lake or the boat launch at Rangeley Lake State Park). 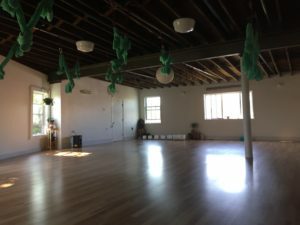 Once you’re in, it’s solitude all the way. 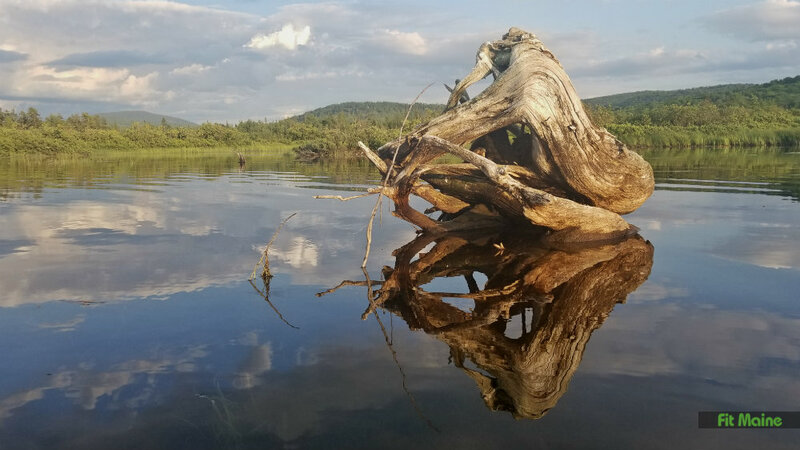 Well, aside from the beavers, who’ll let you know you’re on their terrain with a slap of their tails if you happen to be there in the evening, as they’re waking up. 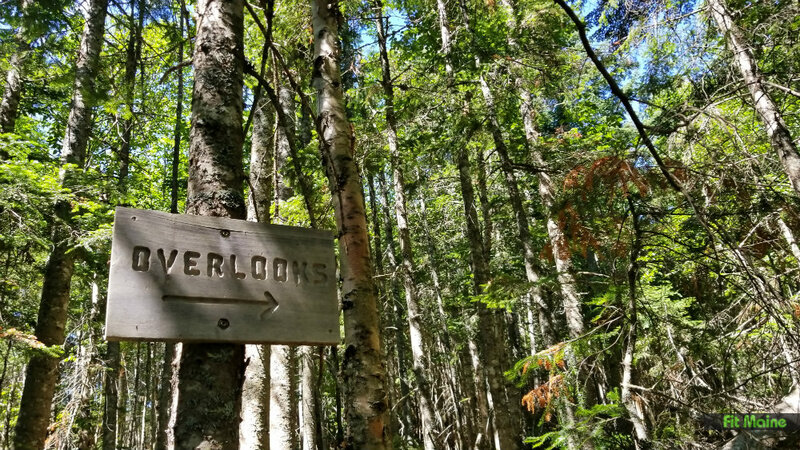 I’m told the stream is a solid place to spot a moose, too, although I never saw any. Public boat launches abound around here, and since I kept my kayak strapped to my car all week, I was able to pull over at every “public boat launch” sign I saw and check things out. One not-so-secret spot I enjoyed was Cupsuptic Lake. 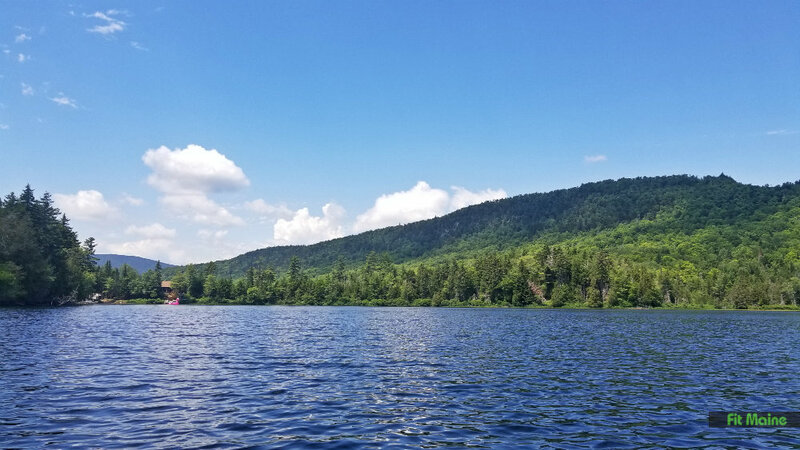 The boat launch is located on the north end of the lake, off Route 16, and Cupsuptic is a decent-sized lake and is connected to Mooselookmeguntick Lake. In theory, you could paddle it all…although I never made it beyond Cupsuptic because I was having too much fun just floating in the sun. Another boat launch spotted as I was headed east on Route 4 to Smalls Falls was for Sandy River Ponds, a small chain of ponds in Sandy River. I saw another duo fishing from a canoe, but otherwise the ponds were quiet. 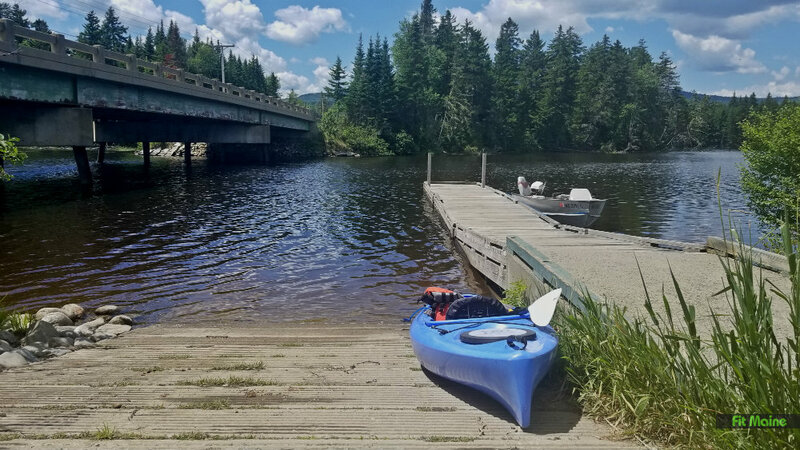 This is a hand-carry boat launch (the ponds are down a short rocky path from the parking lot) with pretty views and some houses along the shore. 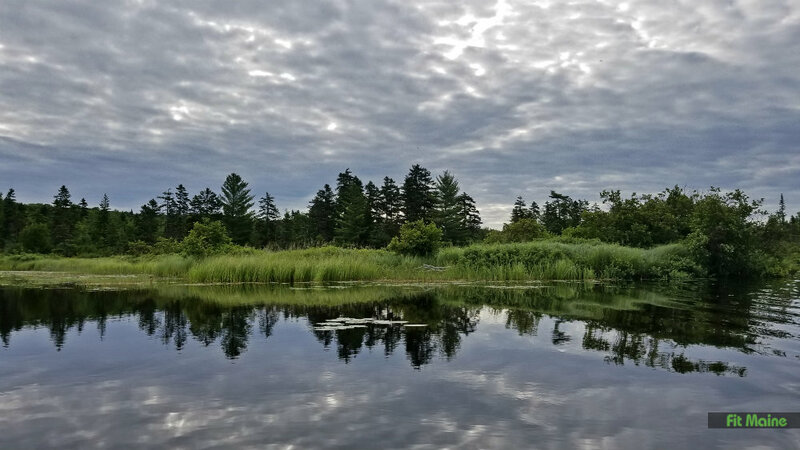 Although there are a few ponds here, you can explore it all in pretty short order. 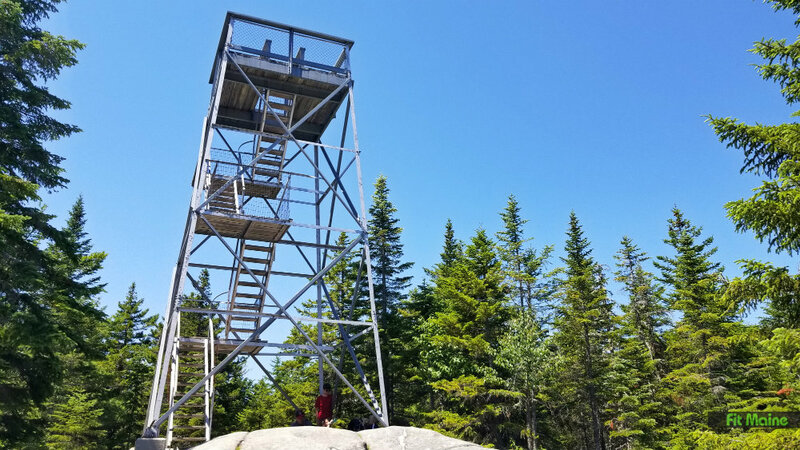 One of the area’s most popular hikes, the summit of Bald Mountain offers stupendous views of the surrounding lakes and mountains, especially if you climb up the tower. 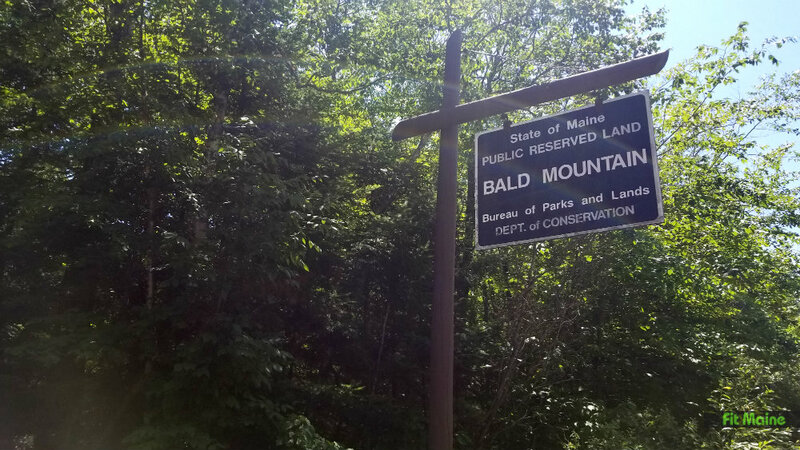 The hike is only one mile from trailhead to summit (if you’re parked at the main trailhead off Bald Mountain Road – there is another trailhead off Route 4). 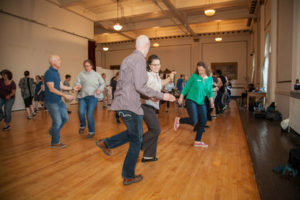 It’s easy-going to start, then gets steeper as you get near the top. 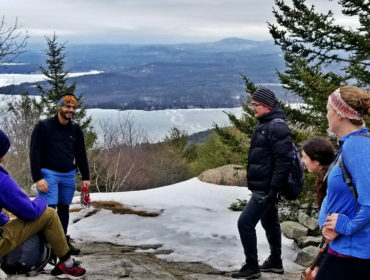 At the summit, definitely climb the tower. Because I love summit lunches, I found a nice spot on the rock to sit and eat. The summit isn’t altogether exposed, so I had to hunt down a place to sit where I could see through the trees. 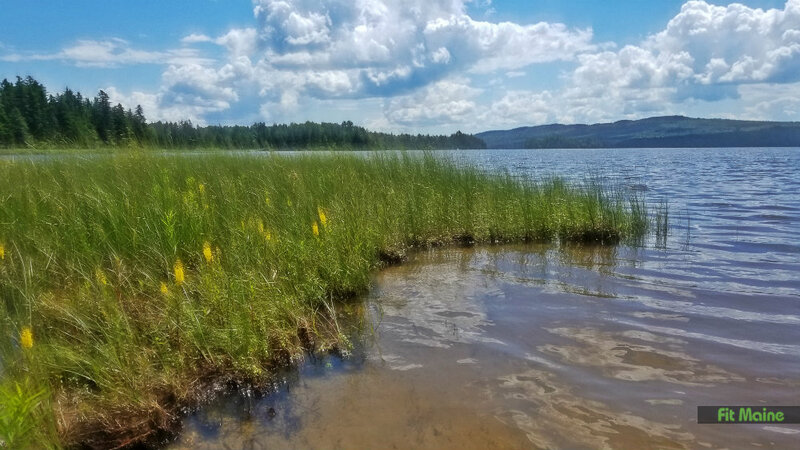 It’s true, there are a lot of mountain ponds in Rangeley, but this one proudly bears the name “Mountain Pond.” So that’s something. 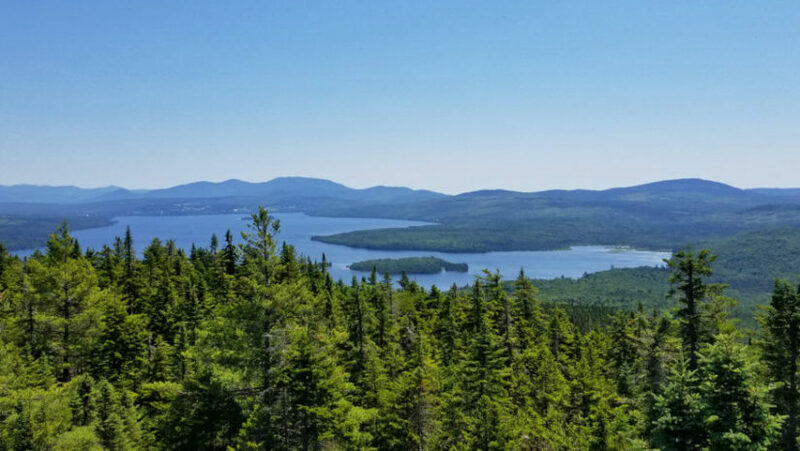 I love this hike because it came as a recommendation from a fellow camper at Rangeley Lake State Park (who I met swimming in the lake). 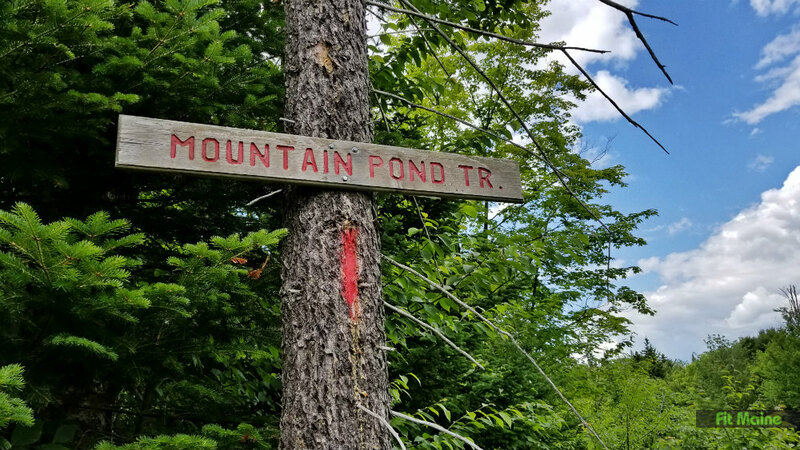 The Mountain Pond trailhead begins just off Edelheid Road (a side road off Route 4). Parking is on the street by utility pole #13. 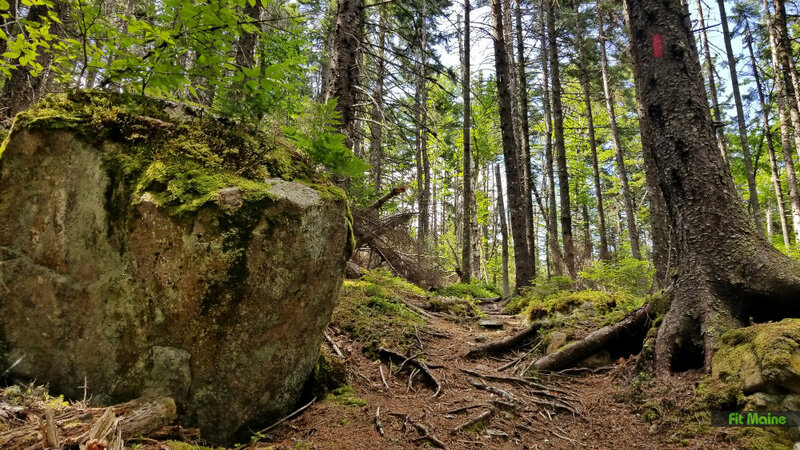 This moderate hike is just under three miles round-trip, and the trail is really well marked and blanketed with roots and moss-covered rocks. 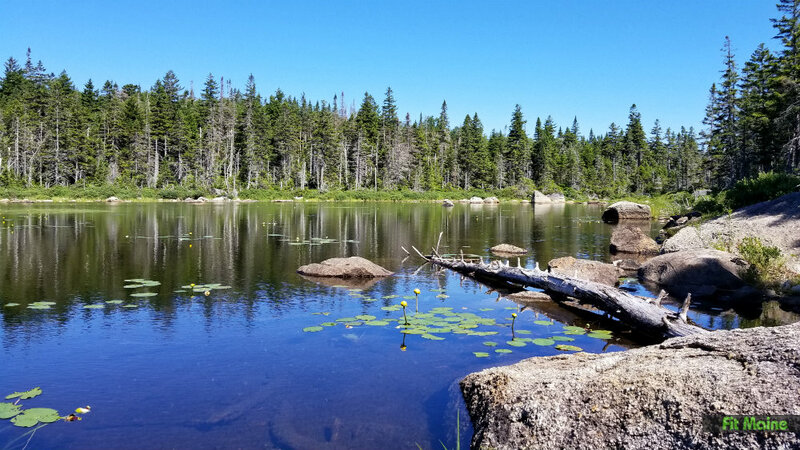 I saw a number of families making the return trip – and heard that the pond is a nice location for frog spotting. 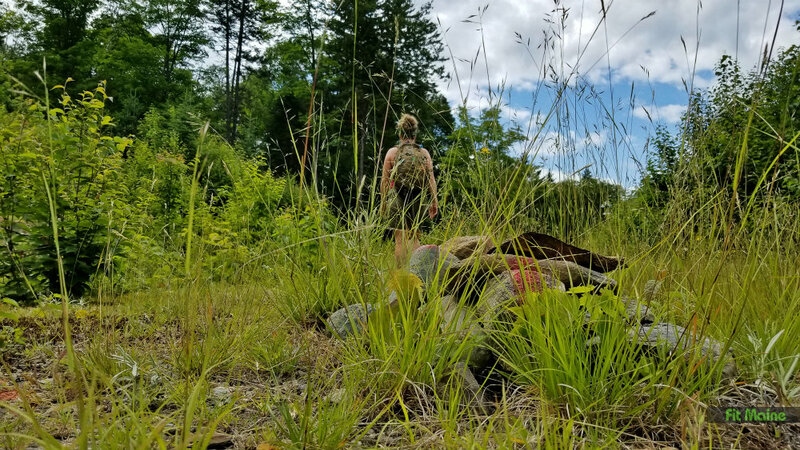 Of course there’s a trail dedicated to Cornelia “Fly Rod” Crosby – an outdoorswoman, outdoors writer, and Maine’s first registered guide, Cornelia even caused a stir back in the day by daring to wear a knee-length skirt to a sportsman’s expo. Cornelia rules. 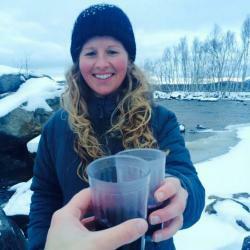 Read more about her. 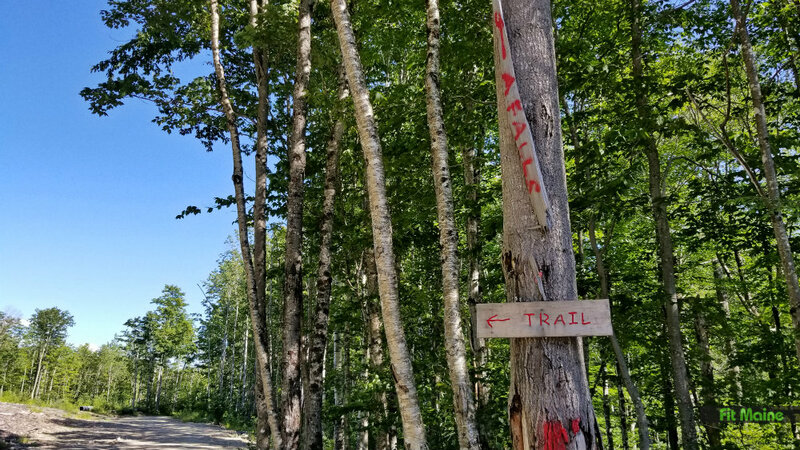 The Fly Rod Crosby Trail is a 45-mile heritage hiking trail that will go from Strong to Oquossoc along the Sandy River, Orbeton and Hardy Streams across the Appalachian Trail and Rangeley Lake to the Sporting Heritage Museum…when it’s complete. 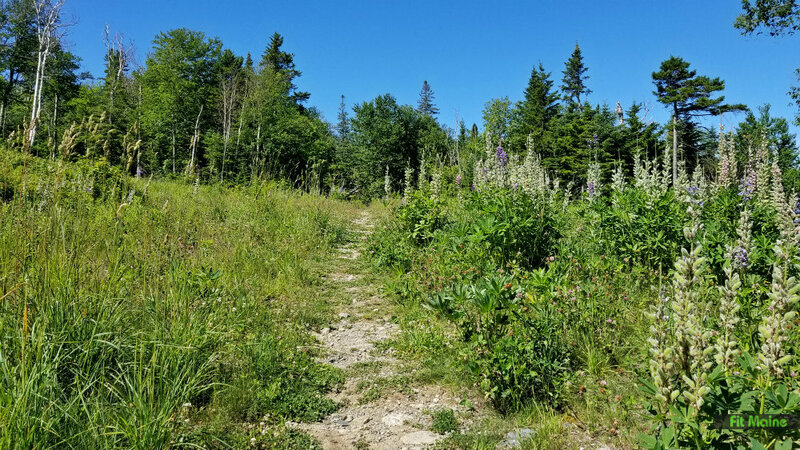 In the meantime, I enjoyed hiking a small bit of it, starting from a parking area at Saddleback Mountain. The small parking area is located at the end of a condo-lined street. 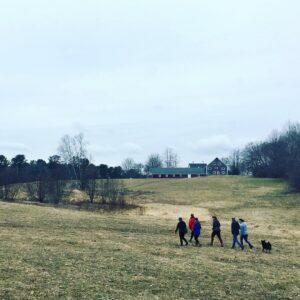 From there, you’ll pass through fields with nice views of the area. 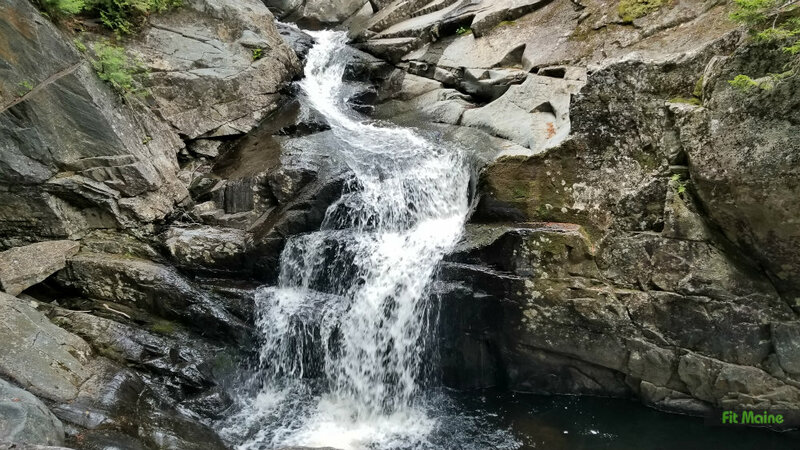 There are a few scenic ponds on the trail, along with overlooks. 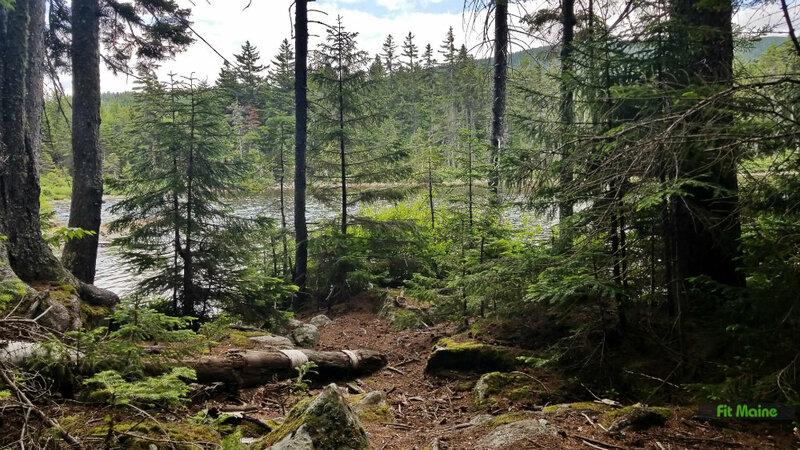 This part of the trail, known as the Rock Pond Trail, is two miles long and easy hiking, with many chances to stop to explore a pond or follow the signs to a scenic overlook. 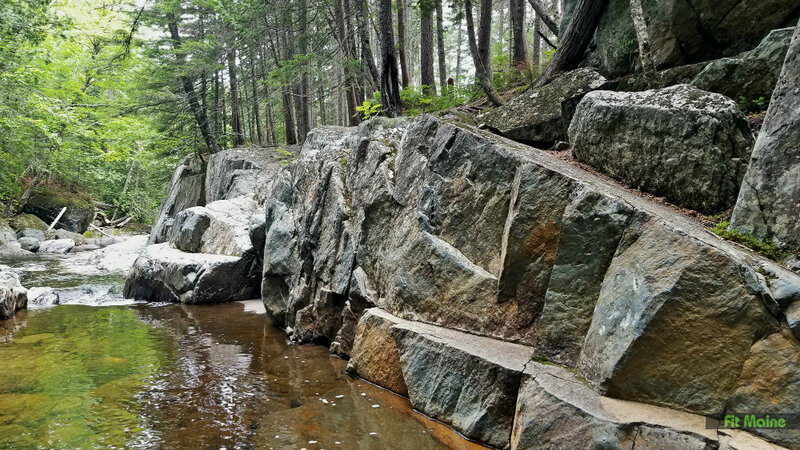 The Rock Pond Trail then meets up with a snowmobile trail, a wide gravel trail that inclines steadily to the west. 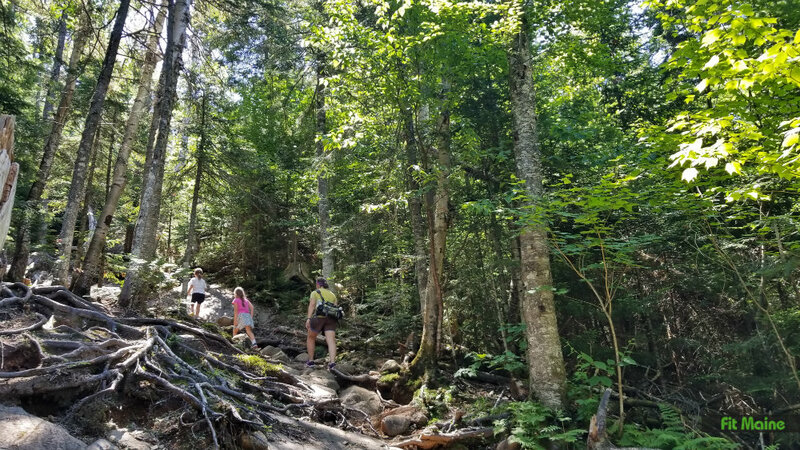 I didn’t love this portion of the trail – it was hot hiking, since the trail is exposed to the sun – but it’s worth taking if you want to lengthen your hike and/or include a hike on parts of the Appalachian Trail. 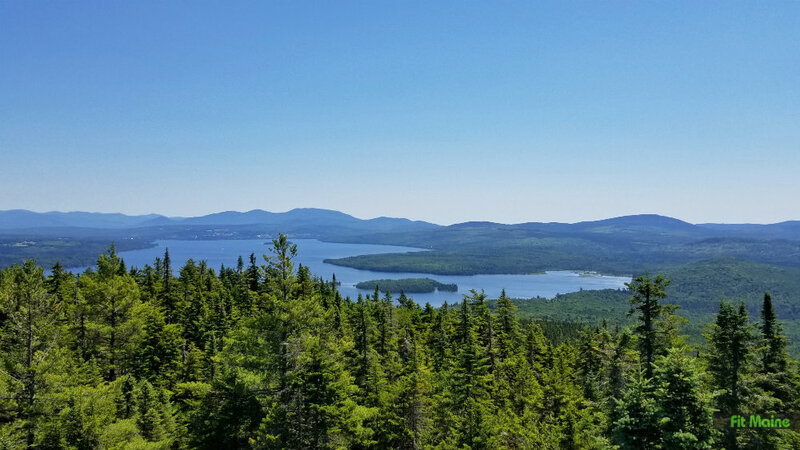 You can hike to Piazza Rock or up to the summit of Saddleback. 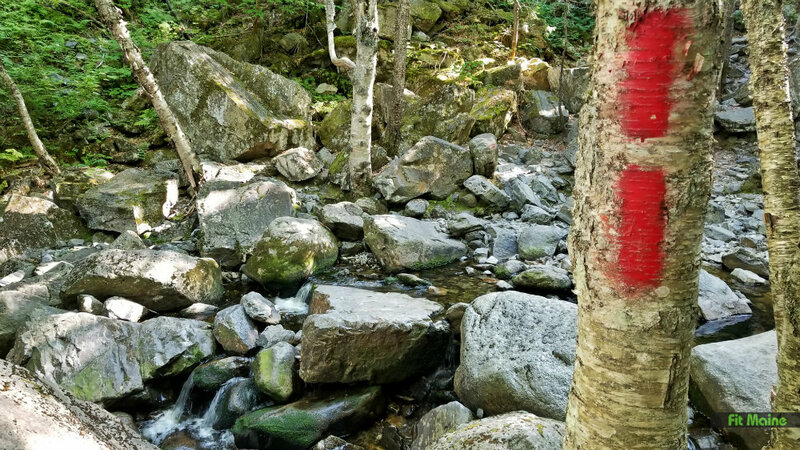 There are signs at the intersection where the multi-use Fly Rod Crosby Trail cross over the AT. 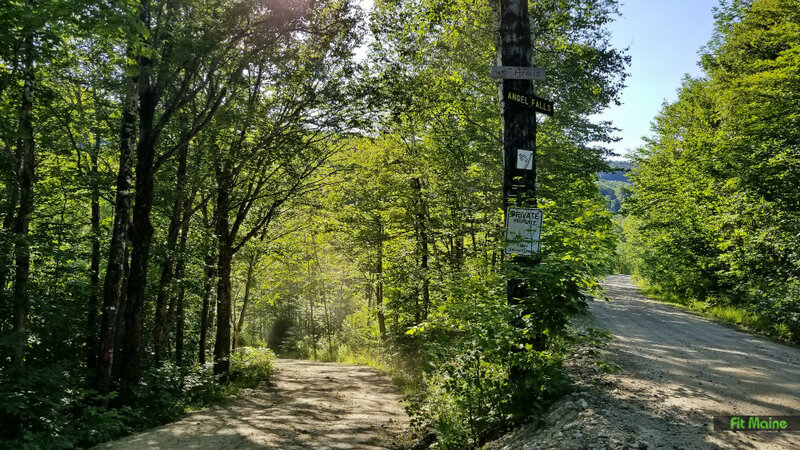 The multi-use portion of the Fly Rod Crosby Trail, which crosses the AT (you can choose to summit Saddleback or hike to Piazza Rock from that intersection). 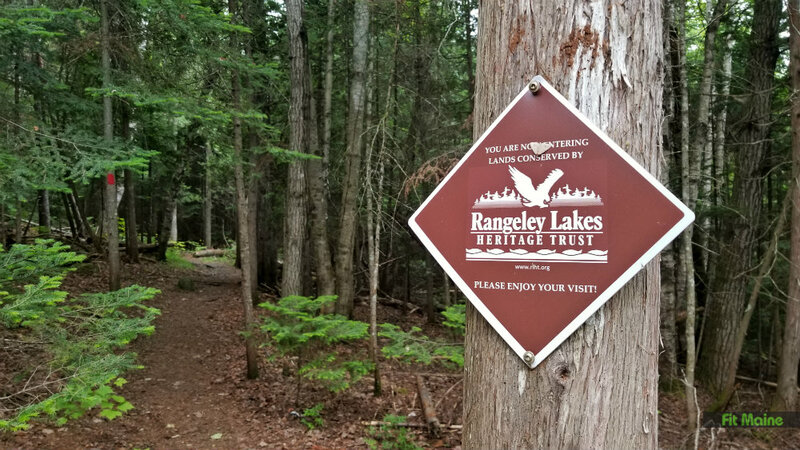 Purchased from a large timber company in the 1990s, Forest Legacy Trails has nine miles of hiking trails that are now managed by the Rangeley Lakes Heritage Trust. 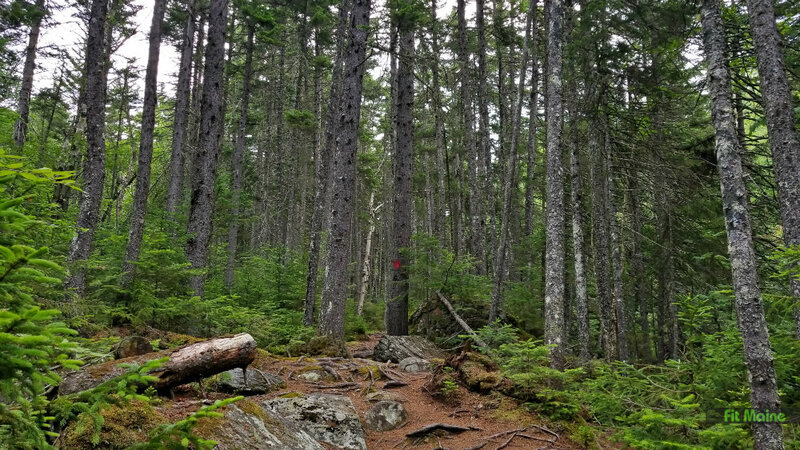 The terrain is moderate to difficult, and you can make your hike longer or shorter depending on the route you choose. 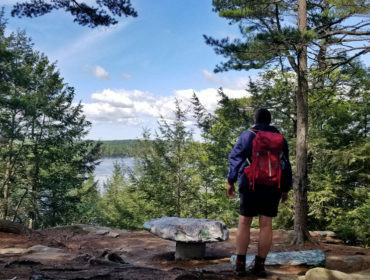 I chose to check out the Timberline Trail, since it was the straightest shot to the water and had a campsite I was curious to see. 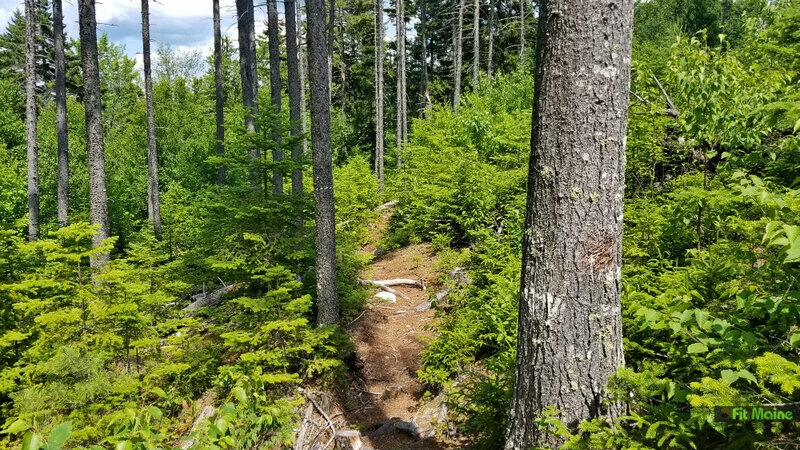 The trail begins on what I assume is an old logging road, growing over with flowers (maps indicate this was a “beta mountain biking trail” in 2017). 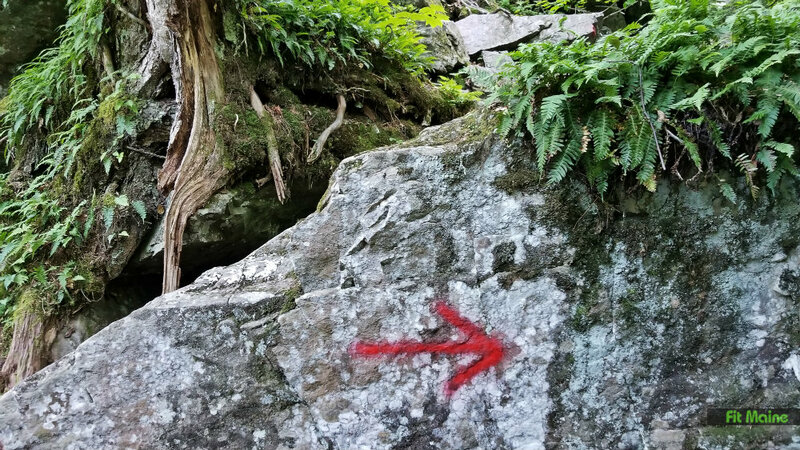 After about a third of a mile, signs indicate the Timberline Trail heading into the woods to the left. 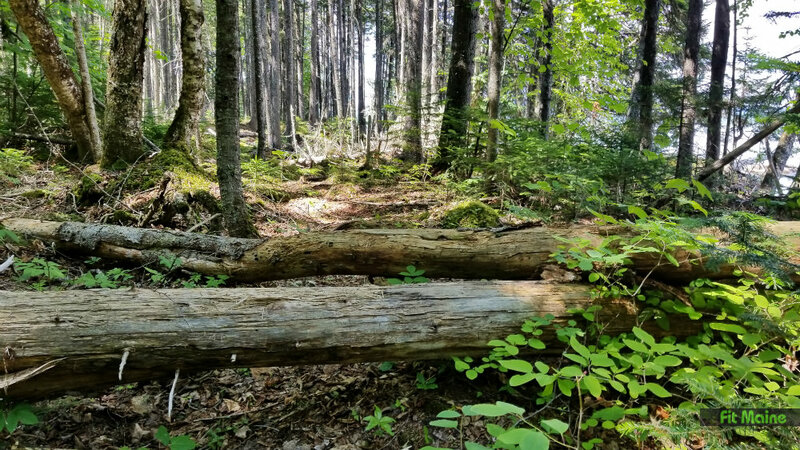 The Timberline Trail rolls along toward the water – gentle ups and downs that make me think this is one of the easier trails. There is a spot or two were the trees thin out enough to see out, but mostly it’s a green canopy. 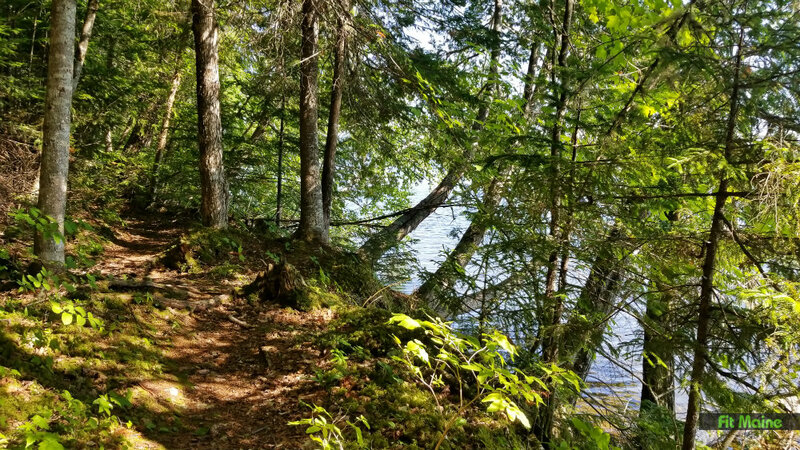 The Timberline Trail ends down by the water, where you can take the Lakeline trail along Cupsuptic Lake or check out the really sweet lakeside campsites. 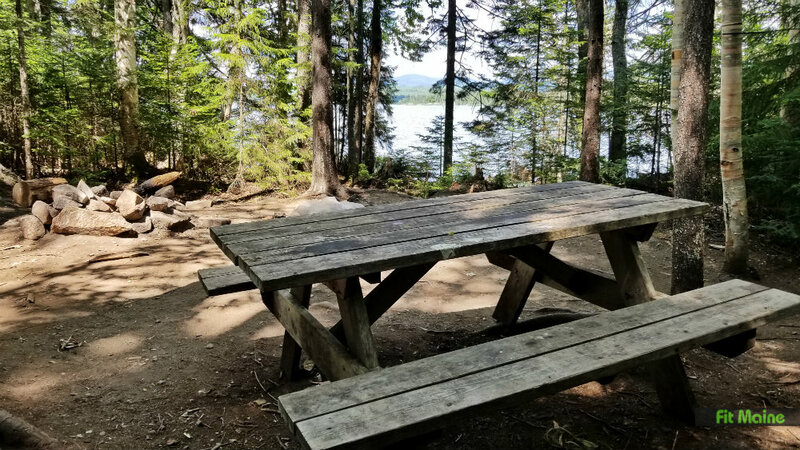 There are four lakeside campsites spread out on the shores of both Cupsuptick and Mooselookmeguntic Lakes. I stopped in at the Raven campsite, which wasn’t occupied at the time. 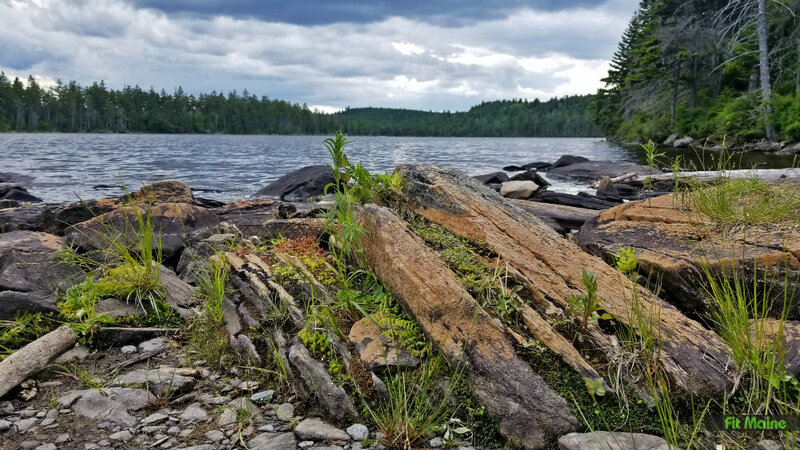 The site is right on the water’s edge. 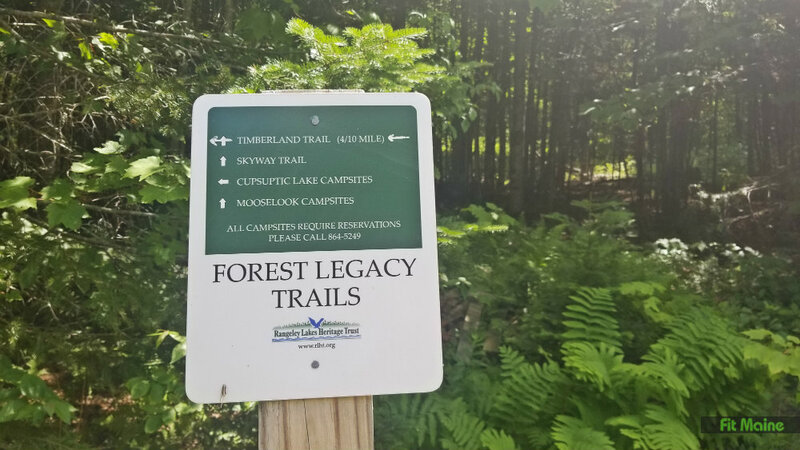 And yes, the Rave campsite (and all of Forest Legacy Trails) is accessible via boat. 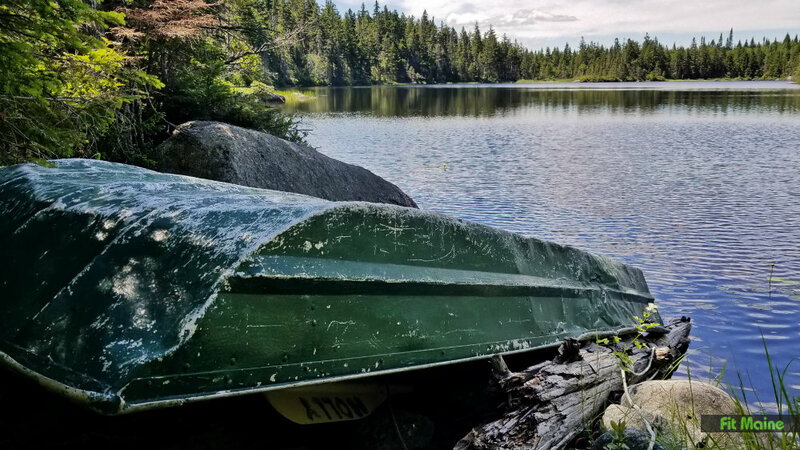 There’s a small dock right there next to the Raven campsite, so you wouldn’t have far to haul your stuff, should you decide to paddle over and camp. FYI: Advanced reservations are required to camp here. 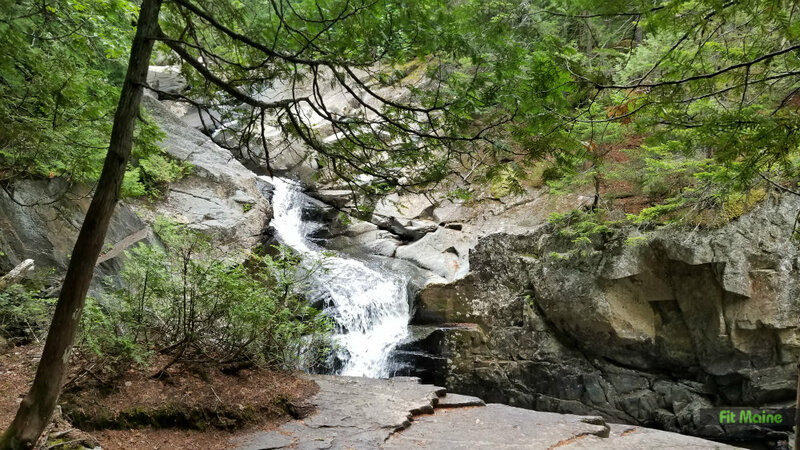 To reserve, call Cupsuptic Campground at 207-864-5249.
Who can resist falling water?! 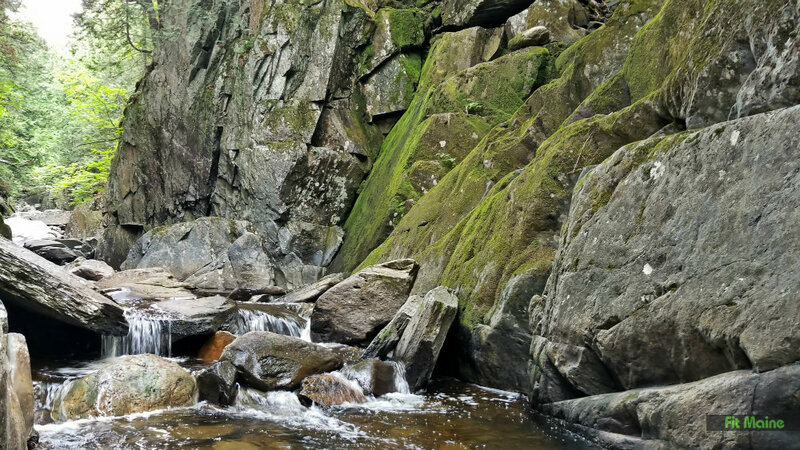 Whether it’s tumbling a couple of feet through a gorge or pouring dramatically down a 90-foot rock face, waterfalls are compelling destinations. 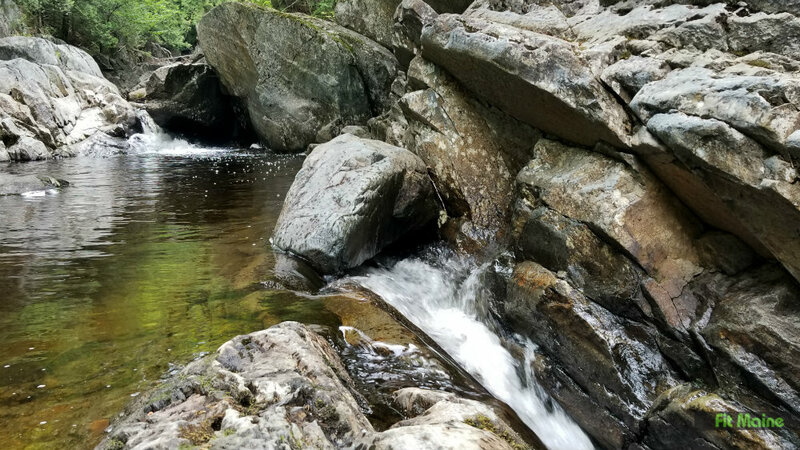 I’ll be honest: I spent a whole lot of time sitting by falling water in Rangeley (I may have even dozed off next to Cascade Stream Gorge). Time well spent. Cascade Stream Gorge is cool. 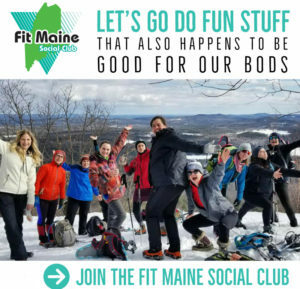 Parking and trailhead are located off Town Hall Road, which is right at the intersection of Route 4 and S. Shore Drive. Follow the signs up a steep driveway to the parking area. 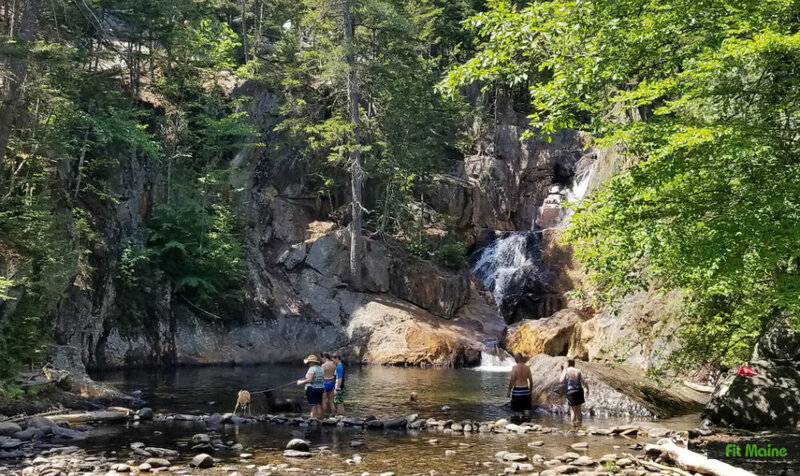 From there, it’s a one-mile loop hike with several areas where you can climb on the rocks, relax and enjoy the view – or even take a cold dip, as I saw many schoolkids doing. 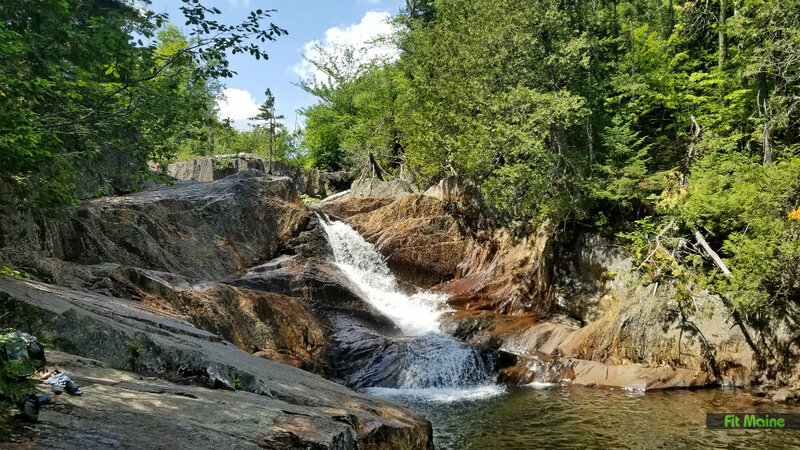 A popular spot for a picnic and swimming, the Smalls Falls rest area is located off Route 4 in West Central Franklin, just a short drive southwest from Rangeley. 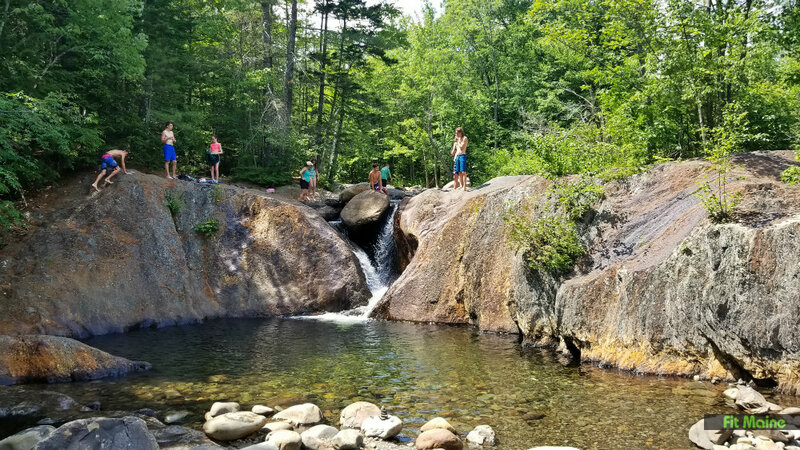 Despite there being few people wherever I seemed to go around here, Smalls Falls was busy with people – families and kids camps clamoring all over the rocks and jumping into the water. 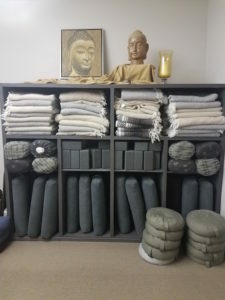 And for understandable reasons. 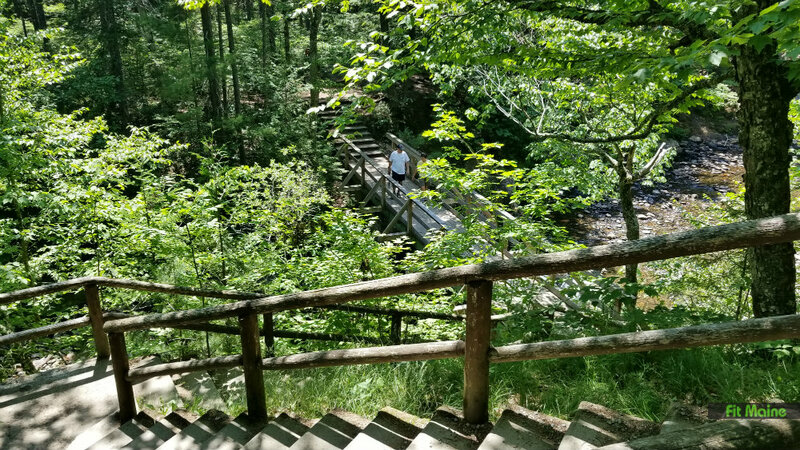 There’s a staircase leading from the parking area down to the base of the falls. Some folks hang here and wade into the water. But most head up up up the the craggy path to the top of the falls. 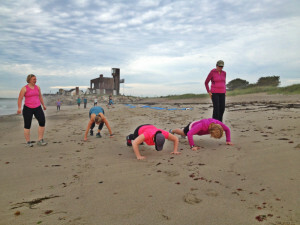 The footing is really uneven here, so bring sneakers and watch your step. It’s worth the steep trip up, though. 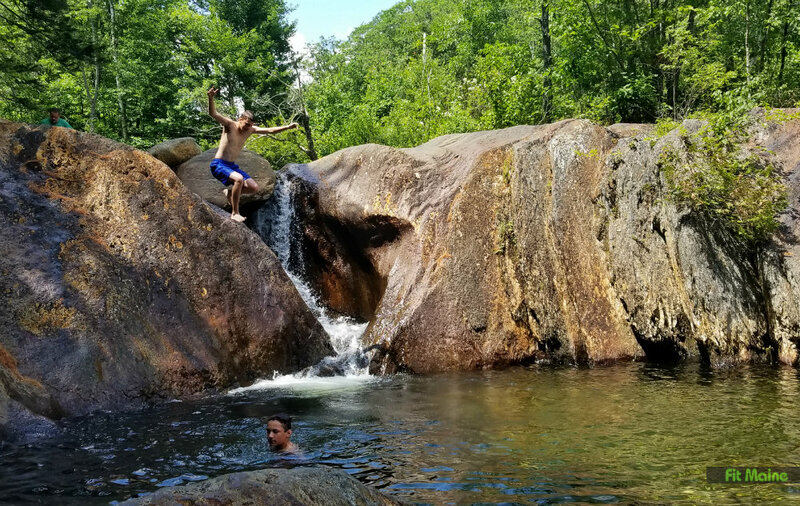 The rock formations are not only neat to look at, they offer a ton of small swimming pools, waterfalls, and places to jump from. But by far my favorite waterfall in the area is Angel Falls. 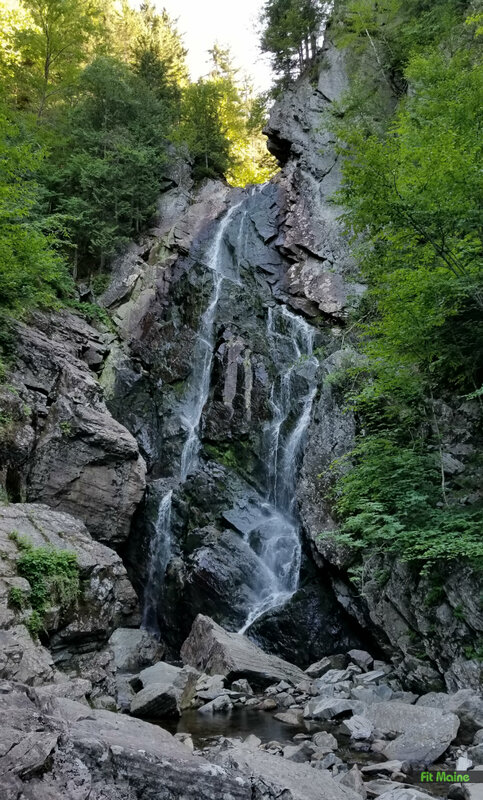 The waterfall itself is dramatic, of course: A 90-foot spray of water down a rock face. But the way there also felt secretive, even though Angel Falls is hardly a secret around here. 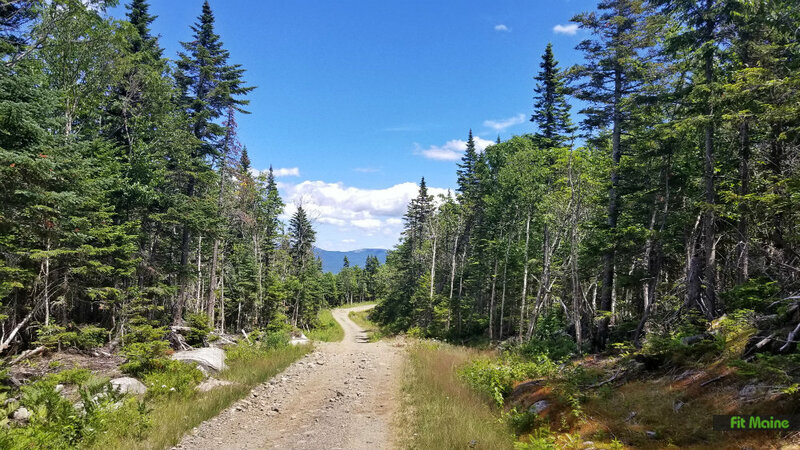 Coming from Rangeley Lake State Park, I took S. Shore Road to Herbie Welch Road (straight across Route 17), then a left onto Bemis Road. 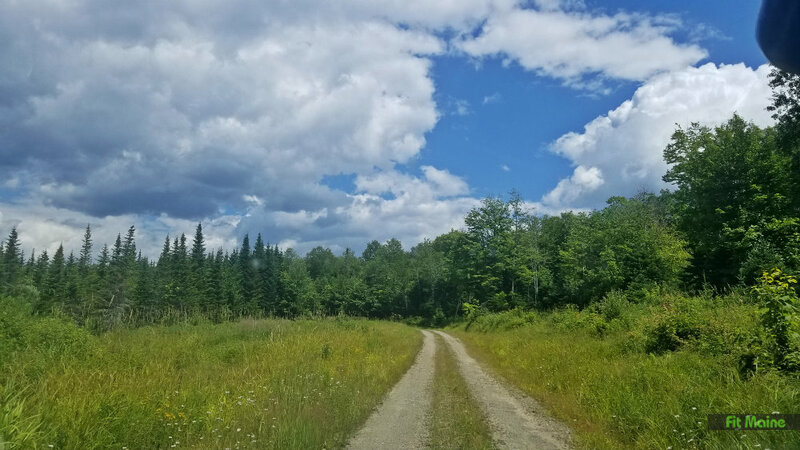 This gravel road has lots of houses on it and quick views of Mooselookmeguntic Lake. But after a few miles there are no more houses. And I didn’t see any other cars, either. And the gravel road gets rough in spots. I was starting to think I was either being punked or had taken a wrong turn. 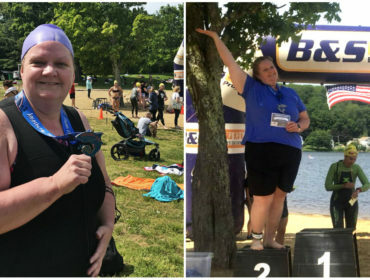 Then, 11 miles later, I saw the turn. 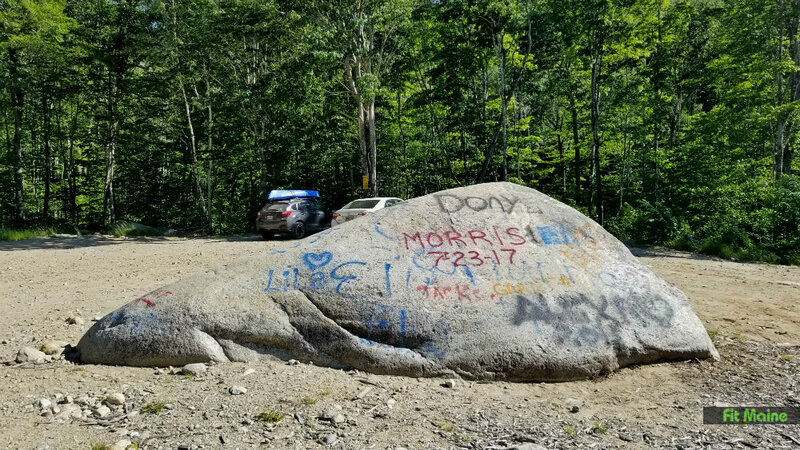 The road goes down into a gravel pit with a nice graffiti-covered rock in the middle. 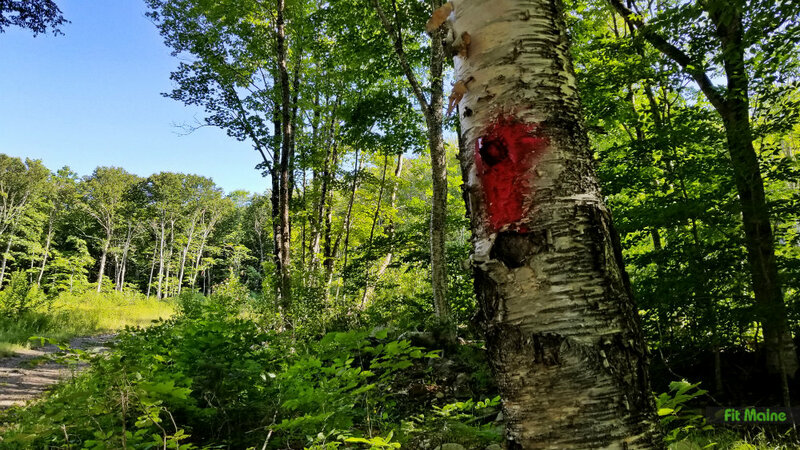 From the parking area, red spray-painted signs and blazes mark the way. 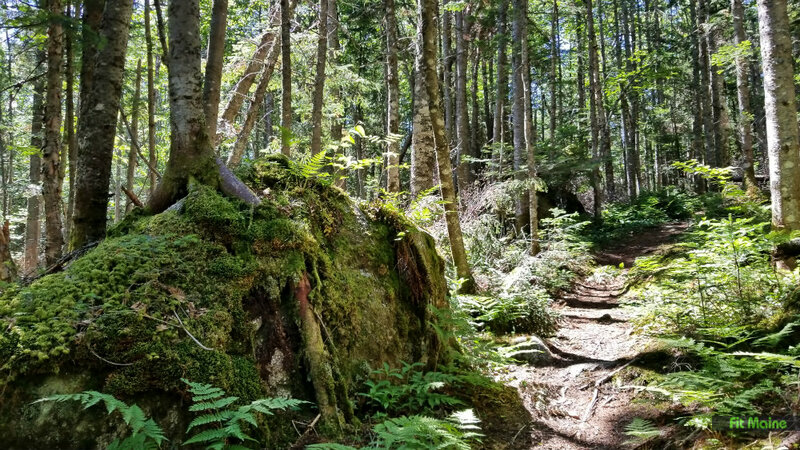 The trail to the falls is one mile round trip, and it gets prettier as you go. 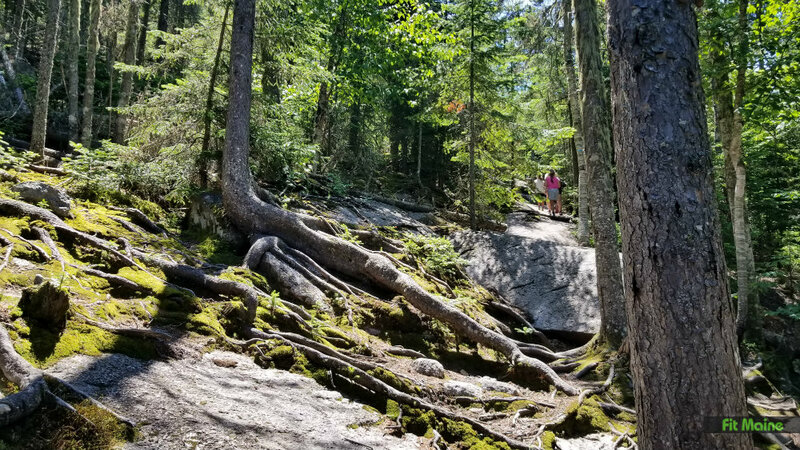 The terrain is mostly easy, aside from a few stream crossings where you’ll need to step from rock to rock.